Welcome to the first issue of our third year publishing RocketSTEM magazine. 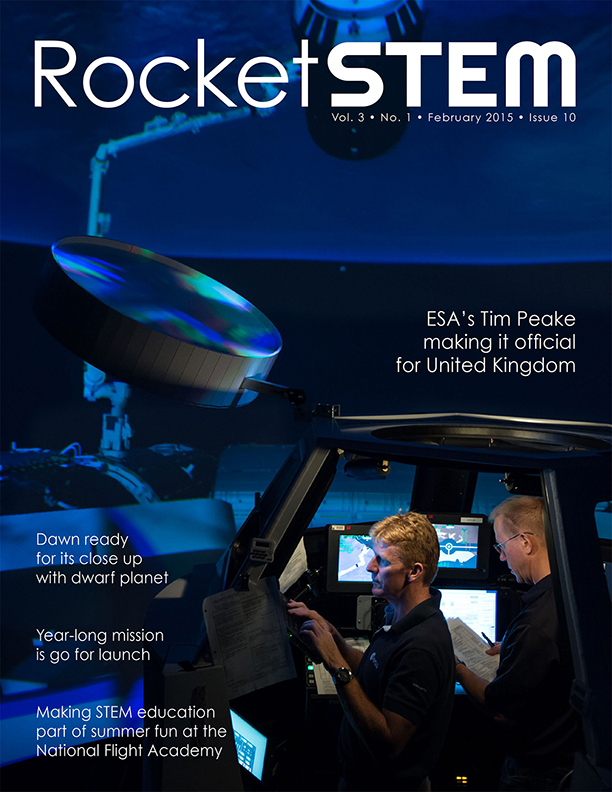 The 10th issue of RocketSTEM magazine features an interview with ESA astronaut Tim Peake, as well as stories on the Dawn, Rosetta and Philae spacecraft, the upcoming one-year mission to the ISS, the National Flight Academy, the Navy’s role in space exploration, and more. Educators and students may reuse the magazine’s material in their classrooms, however, no commercial use or other reproduction is allowed. And, as always, every issue remains free to read online or download as a PDF. 02 NFA Ambition Spend a week aboard the National Flight Academy as an experimental pilot. 08 Navy in Space The space program and the U.S. Navy have a long history of working together. 16 One-Year Mission It will be a 12-month journey for a NASA astronaut and a Russian cosmonaut. 24 Dawn Nears Ceres The Dawn spacecraft is closing in rapidly on the dwarf planet Ceres. 32 Tim Peake ESA astronaut prepares for his mission to the ISS, set to launch in November. 52 Philae’s Landing Despite a bouncy ride, Philae successfully landed on a comet’s surface. Once again we are pleased to announce that a limited number of high-quality printed copies are available for this issue. If interested, please visit www.rocketstem.org/purchase. While there, also consider signing up to be notified should we begin offering an annual print subscription in the future. Since founding RocketSTEM three years ago, we’ve declared that each issue of the magazine will be FREE to read online. As a non-profit organization that is a mission we intend to never stray from, but we need your support in helping us keep that promise. We’ve established a page at Patreon (www.patreon.com/rocketstem) where you can support our endeavours. By making a pledge via Patreon, you will be making a donation automatically after each new issue of the magazine is published. On the months where we do not publish a new issue, you’ll owe nothing. If you wish to make a one-time donation, you may do that through PayPal on our website. Our donation page’s web address is: www.rocketstem.org/donate/. We’ve set up several donor rewards levels, and will be adding more in the future. We’re working on designs for decals, patches, hats and shirts. All that will be made available to donors in the coming months. We hope you enjoy this magazine, and will continue to be inquisitive about the universe we all inhabit. Check out every issue of the magazine!